Is there a difference between national parks and national forests? Yep. And what are designated U.S. wilderness areas? Although these federally-managed, protected lands have a lot in common, there are important distinctions. Here’s an overview of what distinguishes our nation’s parks, forests, and wildernesses. National Parks: In 1872, President Ulysses S. Grant signed the Act that established Yellowstone as the nation’s first national park. Sequoia and Yosemite followed, both designated as national parks in the year 1890. In 1916, the Organic Act led to the creation of the National Park Service, a bureau of the Department of the Interior, to protect all designated national park land. 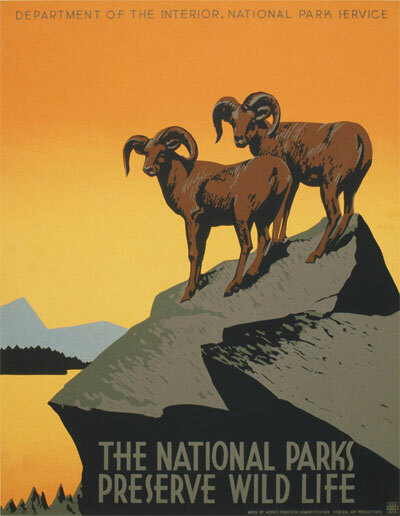 The fundamental purpose of National Park Service is “to conserve the scenery and the natural and historic objects and the wild life therein and to provide for the enjoyment of the same in such manner and by such means as will leave them unimpaired for the enjoyment of future generations.” Hunting, commercial fishing, livestock grazing, mining and logging are all strictly prohibited on national park land. Today, a total of 84.9 million acres has been designated national park land, approximately 3.6% of all land in the United States. Of the 84.9 million acres in the National Park Service, 55 million acres are located in Alaska. The passage of the Act established the National Wilderness Preservation System (NWPS) to protect the then 9 million acres of federal land officially recognized as U.S. wilderness. Wilderness areas are parts of national parks, wildlife refuges, national forests, and the public domain. Today, there are 107.5 million acres of wilderness spanning 44 states and Puerto Rico, accounting for 4.82% of the United States. About half of that total is in the state of Alaska. The largest contiguous U.S. wilderness area is the Noatak and Gates of the Arctic Wilderness in Alaska at close to 13 million acres. Broken up by a series of roads into 35 small wilderness areas, Death Valley Wilderness is technically the largest wilderness area outside Alaska. However, at close to 2.4 million acres, Idaho’s Frank Church-River of No Return Wilderness is the largest, roadless protected wilderness area in the lower 48. Wilderness areas are managed by four federal land management agencies: the National Park Service, the U.S. Forest Service, the U.S. Fish and Wildlife Service, and the Bureau of Land Management. Unlike national parks, wilderness areas allow regulated hunting. And although wilderness areas prohibit logging, mining, and motorized vehicles, some resource extraction and livestock grazing persists in areas where those activities occurred prior to its wilderness status. To be eligible for wilderness designation, an area must be at least 5,000 acres large or a roadless island; appear natural with unnoticeable human presence; provide space for recreational activities and solitude; and contain features that are deemed ecologically, scientifically, or historically significant.